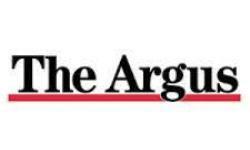 Wearing shades and leaning casually against his car, private detective Nigel Parsons certainly looked the part as The Argus met him in a Brighton car park. 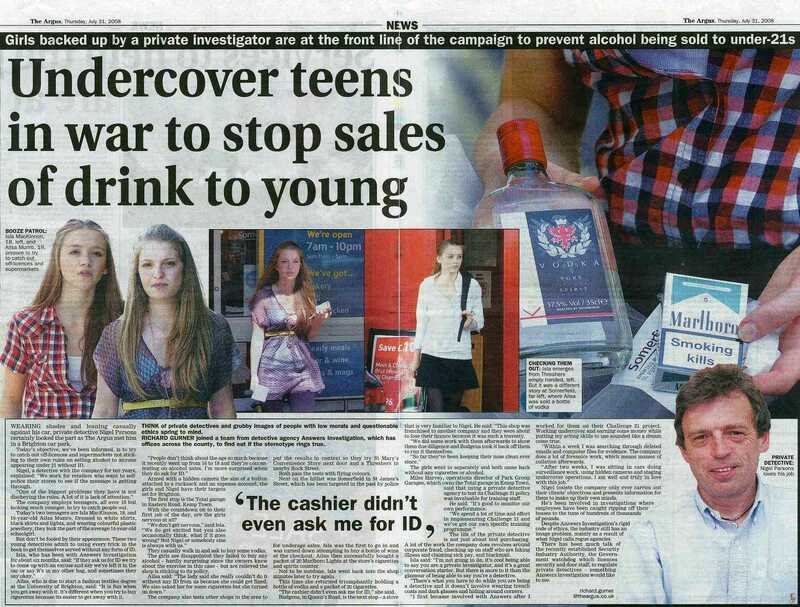 Today’s objective, we’ve been informed, is to try to catch out off-licences and supermarkets not sticking to their own rules on selling alcohol to anyone appearing under 21 without ID. Nigel, a detective with the company for ten years, explained: “We work for retailers who want to selfpolice their stores to see if the message is getting through"
Ailsa, who is due to start a fashion textiles degree at the University of Brighton, said: “It is fun when you get away with it. It’s different when you try to buy cigarettes because its easier to get away with it. Armed with a hidden camera the size of a button attached to a rucksack and an expense account, the girls and Nigel have their targets set for Brighton. The first stop is the Total garage in Eastern Road, Kemp Town. With the countdown on to their first job of the day, are the girls nervous at all? “We don’t get nervous,” said Isla. They casually walk in and ask to buy some vodka. The girls are disappointed they failed to buy any alcohol – hardly surprising since the owners knew about the exercise in this case – but are relieved the shop is sticking to its policy. Ailsa said: “The lady said she really couldn’t do it without any ID from us because she could get fined. The company also tests other shops in the area to put the results in context so they try St Mary’s Convenience Store next door and a Threshers in nearby Rock Street. Both pass the tests with flying colours. Next on the hitlist was Waitrose in St James’s Street, which has been targeted in the past by police for underage sales. Isla was the first to go in and was turned down attempting to buy a bottle of wine at the checkout. Ailsa then successfully bought a packet of 20 Marlboro Lights at the store’s cigarettes and spirits counter. Not to be outdone, Isla went back into the shop minutes later to try again. This time she returned triumphantly holding a bottle of vodka and a packet of 20 cigarettes. “The cashier didn’t even ask me for ID,” she said. Budgens, in Queen’s Road, is the next stop – a store that is very familiar to Nigel. He said: “This shop was franchised to another company and they were about to lose their licence because it was such a travesty. “We did some work with them afterwards to show them due diligence and Budgens took it back off them to run it themselves. The girls went in separately and both came back without any cigarettes or alcohol. 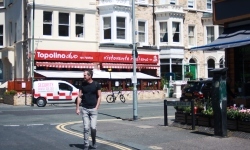 Miles Harvey, operations director of Park Group Garages, which owns the Total garage in Kemp Town, said that using a private detective agency to test its Challenge 21 policy was invaluable for training staff. He said: “It’s good to monitor our own performance. The life of the private detective is not just about test purchasing. A lot of the work the company does revolves around corporate fraud, checking up on staff who are faking illness and claiming sick pay, and blackmail. Isla said: “I’m not going to lie, it’s cool being able to say you are a private investigator, and it’s a great conversation starter. But there is more to it than the glamour of being able to say you’re a detective. “There’s what you have to do while you are being a detective and it doesn’t involve wearing trench coats and dark glasses and hiding around corners. “I first became involved with Answers after I worked for them on their Challenge 21 project. Working undercover and earning some money while putting my acting skills to use sounded like a dream come true. “Within a week I was searching through deleted emails and computer files for evidence. The company does a lot of forensics work, which means masses of collation afterwards. Nigel insists the company only ever carries out their clients’ objectives and presents information for them to make up their own minds. He’s been involved in investigations where employees have been caught ripping off their bosses to the tune of hundreds of thousands of pounds. Despite Answers Investigation’s rigid code of ethics, the industry still has an image problem, mainly as a result of what Nigel calls rogue agencies. There has been much talk of the recently established Security Industry Authority, the Government watchdog which licences security and door staff, to regulate private detectives – something Answers Investigation would like to see.